While dogs are looked upon by many as loyal companions and members of the family, they can also be dangerous animals capable of causing serious harm to strangers. 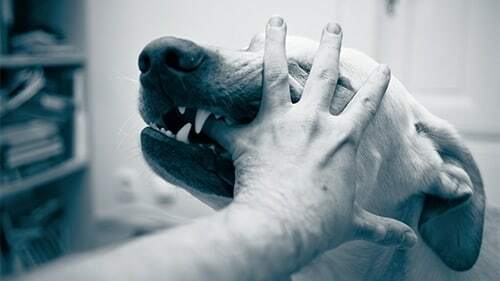 The Peoria dog bite attorneys of Rosenfeld Injury Lawyers LLC represent the interests of those who have been attacked by animals that have not been properly trained or restrained and who require expensive medical care due to their injuries. Our knowledge of Peoria’s animal ordinances allow us to defend the rights of ordinary people by forcing dog owners to account for the damage done by their animals when they have not taken the proper precautions to keep their dogs at bay. Local ordinance protects the rights of residents when facing an attack from a dangerous animal by requiring dog owners to register their animals, treat them humanely and provide compensation when their animals cause damage to property or bodily harm. Following are some of the laws pertaining to animal ownership for those living in Peoria. Allowing a dog to roam free is prohibited by Sec. 4-2 and dog owners are subject to fines if their dogs are found to be running free. The fine for the first violation is $50 and increases with each additional violation to as much as $300 if the owner is guilty of multiple violations. Animals must be restrained when not on their owners’ property. This means that owners must leash their dogs at all times when off their property. Sec. 4-6 requires owners to treat their dogs in a humane manner, which includes providing food, water, shelter and regular veterinary care to prevent disease. This is to ensure that their dogs do not transmit disease in the event they get free and attack another person. All dog bites must be reported to the police within 24 hours, according to Sec. 4-13 and any person who has knowledge of an attack and fails to notify the authorities is in violation of this law. Sec. 4-15 holds property owners liable if they take in stray animals. Strays may be sheltered for up to 48 hours while notifying animal control or an animal shelter. Sec. 4-20 affords protection to dog owners from frivolous lawsuits by prohibiting the intentional provocation of dogs. If someone attempts to cause harm to an animal or provokes an attack, he or she will be considered at fault for the incident and unable to seek damages from the dog’s owner. Sec. 4-52 required all dog owners to register their animals. In order to complete their registration, records must be provided to show that the dogs have been properly immunized and are free of disease. If a dog is involved in an attack, the dog will be impounded for ten days and released only if a licensed veterinarian can affirm that the dog is not afflicted with rabies, according to Sec. 4-59. The injuries suffered when someone is attacked by an animal can leave a lifelong impact on the victim’s physical and psychological wellbeing. Aside from unsightly scars, tissue and nerve damage and the risk of infection due to the introduction of microbes in the dog’s saliva, victims often suffer emotional trauma from needing to live with an altered appearance or from the fear of being attacked again in the future. Victims may find it extremely difficult to ever be in the presence of animals in the future and panic whenever a dog comes near. All injuries are considered when seeking compensation for an attack whether they are physical, mental or emotional. Rosenfeld Injury Lawyers LLC aggressively pursues damages from negligent dog owners because we feel that the demeanor and actions of animals are more often reflective of their owners’ treatment than on other factors. Owning a dog can be a wonderful and enriching experience, but it comes with the responsibility of making sure that the animal is not placed in a position to do others harm. If you have been injured in a dog attack in Peoria, IL, contact us today to learn more about your rights and legal options during a risk free consultation. Our Peoria dog bite attorneys will review the details of your case, perform a thorough investigation and advise you on the best legal strategy going forward so that you can recover the compensation you are entitled to under Illinois law. In order to be able to offer our services to people from all walks of life and to show our commitment to your interests, we promise never to require attorneys’ fees unless we are able to secure compensation on your behalf. Therefore, if we fail to recover the compensation you are entitled to, you will owe us nothing.